Creating your Website begins on your computer. It can be done offline, on your computer with a HTML software, or Online with Online Web Builder, provided by your Hosting Company. Once your website is created, it needs to be published, so the whole world can see it. Website created on your own computer, needs to be uploaded to Web Server. It can be done with a FTP program, or with Web Interface. In case Website is built using Online Builder, there is no need to upload anything. You only need to click on publish button in Online Builder. Once you sign up for a hosting account, you get access to your own Control Panel. This is the place where you control everything about your website. You can configure email accounts, manage databases, install scripts and a lot more. Most popular control panels are cPanel, Vdeck and Plesk. 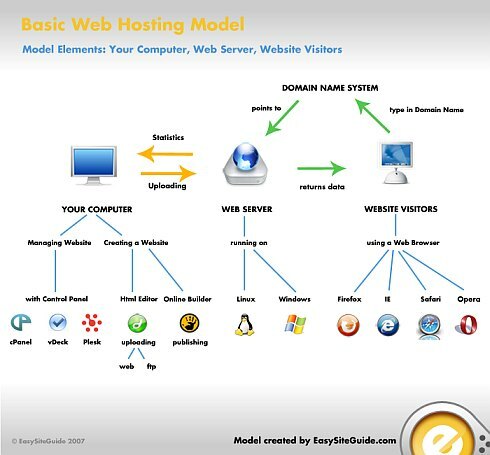 Web Server is a computer designed to serve web pages. It can run on Linux or Windows platform and serve hundreds of pages. Web Servers are usually located in data centers, which are power redundant, and connected to high-speed internet connections, also called Internet backbones. The whole point of data centers is to make sure websites are constantly online. Interaction between Web Server and Surfers begin, when Surfers enter a domain name in their Web Browser. In just a fragment of a second, domain name is resolved in a domain name system (DNS) and Web Browser connects with a specific Web Server. Web Server returns request and sends Surfer data that is shown in Web Browser. Most popular Web Browsers are Firefox, Internet Explorer, Safari and Opera. As you can see, in each part of the process there is some Hardware and Software used for the system to work.